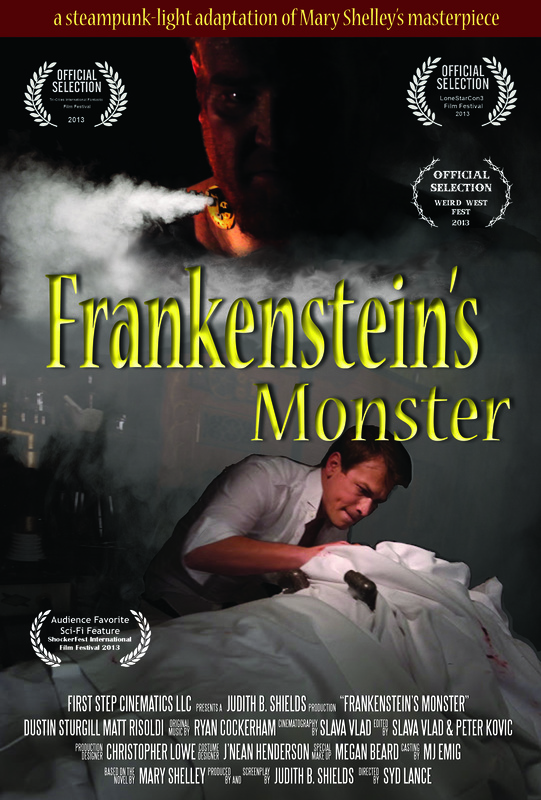 Frankenstein’s Monster is a steampunk-light adaptation of Mary Shelley’s classic. Click HERE to see the production’s blog. Click here for the IMDb page. Official Film Selection List (more to come) at bottom of page. Available for rent or purchase at Amazon. With a production budget equal to the cost of a motorcycle, we shot this 108 minute film in 14 days. We used DSLR cameras with manual focus and filmed in 1080p & 24 frames per second. From the first keystroke from our writer to the final post-production date, Frankenstein’s Monster total project time is 1 year 1 month. 10 out of our 18 member cast are Shakespearian trained actors. 8 of the 32 cast and crew are educators. Our youngest actress is 16, our oldest actor is over 70. Our community hails from New York, California, Texas, Siberia, Spain and Italy. The entire film was shot in 12 unique locations within south-east Texas, including 8 historical landmarks. J’Nean Henderson (the Victorian Lady) is the costumer and supplier for the majority of scenes. Special thanks to Galveston Island Costumes. The steampunk accessories were made by two individuals knowledgeable with steampunk craft and art: Margaret Hubbard and Preacher’s Powderworks and Projectiles. Christopher Lowe, our technical director, designed and built our lab set inspired by Edwardian technology and apothecaries. A touch of the morbid: Sheets from an actual mortuary were used in this production. The tree where Justine is hanged is an actual “Hanging Tree” where criminals in Texas would be executed. In one scene, the crew kept the original ghost bells hanging above the stairwell. It’s been an exciting experience to be the filmmaker for this project and to see it transformed in real life by actors, the director, the editors, and the cameras.